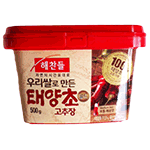 Doenjang soybean paste is a core ingredient in Korean cuisine, with salty and rich, fermented flavours. Doenjang soybean paste is made from fermented soybeans and is similar to Japanese miso – though doenjang has a coarser consistency and stronger taste, which works well in thick soups and stews like Korean jjigae. 18 month shelf life. Product of Korea.